This project turns the micro:bit into a simple step counter. A step counter is also known as a pedometer. Each shake event increments a counter variable. The step count is displayed on the LEDs. To build a counter, we’ll need a variable to store the number of steps. 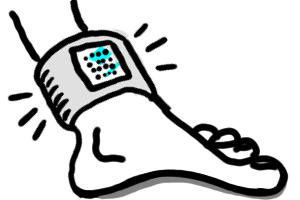 Assuming you attach the micro:bit to your foot or ankle, it will get shaken when you take a step. We can use the ||input:on shake|| event to detect a step (it should notice a step most of the time). Let’s add the code to increment step by 1 when the micro:bit is shaken. How many steps so far? We want to always see how many steps were counted. In a ||basic:forever|| loop, we add a ||basic:show number|| block to display the value of step. Did you notice there is a lag, or delay, in the display of steps? This is because the step value can change while the micro:bit is displaying a number. To remove the lag, add ||led:stop animation|| after changing the value of step.